Change is not a journey. Never has been. Trouble is: Change agents around the world have been imagining change as projects, programs, planned exercises to be “kicked off” and “implemented”. We have interpreted change as difficult ventures, endlessly long hikes, and exhaustive trips. No more: Here are 5 key insights into the true nature of change, and into how to create profound, transformational change, effortlessly and fast. Sounds impossible? Then check out these concepts for a more constructive and robust alternative to change management, or planned change, as you know it. The most widely used metaphors of change are related to that of a journey from the current state (often labeled ‘status quo’) to the desired state (a.k.a. ‘vision’). The desired state, in this metaphor, is seen as a place out there in the future. Or as a north star — never quite to be reached. We tend to believe change-as-a-journey has to be long and arduous. That it is hard and dangerous. Consequently, armed with delusional maps, project plans, or blueprints, we embark on what we imagine will be a long and difficult journey. We start to foresee all sorts of obstacles — that don’t actually exist, as we will see later in this article. But we find ourselves believing the milestones we invented are real, and get anxious when they don’t appear on the horizon. This approach misrepresents change as a “controllable process” composed of a sequence of discrete stages, phases or steps; and it deludes us into thinking we have to make a map for getting from the current state of affairs to the desired state. So this approach also trivializes change. We call this approach Planned Change. This is what we commonly think change management is all about: planning and controlling the change journey. The journey metaphor tricks us into ignoring the possibility that the desired change might be accomplished quickly, with little effort, right now, with existing resources and with minimal disruption. The metaphor itself makes change hard. Now, spill a tiny bit of milk into coffee, and with this tiny nudge a new pattern is instantly being created. It’s altogether different from the original one, pure coffee, and the change is permanent. there is no way of returning to the first pattern. This is much more similar to what change actually is than calling change a journey. This is a more helpful metaphor than the widespread notion of seeing change as a “journey from here to there”. It means to see change as a something of a flip from Now (the current state) to New (the desired state). What is important: Both Now and New are in the present, not in the future. The New can be produced right here, right now. Profound change, different than problem solving, requires a sequence of flips. Or many flips. The man who invented Resistance in Change is Kurt Lewin, one of my heroes. Lewin, the brilliant founder of social psychology and of organizational change as such, introduced the term resistance as a systems concept: as a force affecting managers and employees equally. Unfortunately, only the terminology, but not the context, was popularized. We now cast resistance as a psychological, individualized issue, personalizing it as “employees versus managers”. In this mental model, it is always the others. Employees “resist”, top management “isn´t committed”. We judge others saying things like: “They have an interest in preserving the status quo.“ The They is very important, of course. The resistance assumption is implicitly arrogant. As long as we accept this mental model, it confuses our understanding of change dynamics, perpetuates the status quo and command-and-control organization. It´s better to let go of the term and embrace more helpful mental models for change. Can you say that to yourself, in your head? Now that is a start. But what is behind the behavior, then, that we are observing all the time, in change efforts, if it is not resistance to change? Take a step back and you will see that people act consciously and intelligently (overall), to other things than the change itself. They may resist loss of status and power — which is quite intelligent. They may resist injustice, stupidity and being changed. Which is also intelligent. The change may also cause need for learning that is not properly addressed. And these are the things that we have to deal with in change: power structures, status, injustice, consequence, our own stupidity, top-down command-and-control, and learning. Instead of watching out for the possibility of resistance, we should watch out for common mistakes in implementing change and deal with the perfectly natural reactions to (our) poor interventions. Let me be clear: The notion that people resist change is not held up by social sciences. It is actually completely opposed to our scientific knowledge about human capability to change (Alan Deutschman wrote a wonderful, summarizing book about this). But It is a fairy-tale that people resist change. There are symptoms of struggle with adaption and the new that should not be confused with resistance to the change itself. Once you start with kind of projection, the trouble really starts. We generally tend to have a hard time imagining future possibilities, though. This is why any change effort will have to deal with the need for imaginization, or visioning. If resistance does not come from people, then where does it reside? Resistance is much more likely to be found elsewhere. Edwards W. Deming said: “94% of the problems in business are system-driven and only 6% are people-driven.” Which means: If the problem is in the system, almost always, then change should mostly be about working the system. Change in this sense is successive re-negotiation of the organizational model — not revolution! Kotter´s NoNo has good reasons to oppose the change — reasons that are probably triggered by the current system, not the individual´s twisted psyche. Again: What we observe should ultimately be coined lack of consequence, not resistance to change. Which all leads us back to the conclusion: In change-as-constant-flipping, we must work the system, not the people. Diverting from this path leads to blaming, and almost inevitable to self-induced failure of our change efforts. The idea of Emergent Change, or continuous flipping from Now to New acknowledges that change happens within complex pattern that cannot be predicted or controlled — but only observed. One of the first to describe this kind of thinking on change coherently was John Kotter. His Leading Change approach neatly outlined profound change as dense, social movement: The collective, emergent side of change, so to say. The element that was still be missing from this change approach is the individual side of change — the need for individual adaptation that members of an organization have to undergo to flip or when flipping. Adding the individual side of org change to the collective side, one starts perceiving change as two-dimensional. We call this the double helix nature of change. There are many decent or effective methods, but what really matters is creating different relationships within the system, and relationships of higher quality. Many methods can help doing that. In fact, the more complex the problem is, the more complex, or social, the method must be. Nothing is worse than crystallized method — or “dead” method, applied to living problems. We will explore this aspect of change and complexity-robust method in future articles. I am guilty. I am guilty of talking about transformation myself. A lot. And I liked it! I liked to say things like: Organizations should transform from the organizational model of the industrial age (“Alpha”) to a contemporary, complexity-robust one (“Beta”). I keep saying that kind of thing, occasionally, even though I know the term transformation is neither helpful, nor accurate. Sometimes I just can´t help it! This is consistent with the old adage “Everything is an intervention.” Which is one of the most beautiful things that has ever been said about change (which probably is a rather misleading term, as well). That everything is an intervention does not mean, of course, that every intervention is good in itself. It just means that everything, really everything, influences, or potentially flips an organization. Instead of change management, we should practice the craft of change as exercising constructive irritation — as we like to say in systems theory. According to systems theory, the only thing you can do is to irritate a system. Then observe the consequences and ripple effects. Then irritate again. Then observe. And so on. Any irritation can flip the system into the New state. If you are lucky and if the irritation was smart enough, the state is a form of desired state. In any case: irritate again. This is never supposed to be over. It´s not a journey, remember? Welcome to the world of, well: Eternal flipping. Here are a few other related articles by Niels: Org Physics: How a triad of structures allows companies to absorb complexity and Flat hierarchies: Just another step in the wrong direction. The “flipping” and “Now to New” wording/idea from this article were inspired by Jack Martin Leith. and his wonderful writing. Some of the insights on resistance in this article were inspired by Eric Dent´s beautiful article on the same matter. Niels Pflaeging is a leadership philosopher, management exorcist, change curator, speaker, author, and globally working advisor on leadership. He is the author of the business bestseller Organize for Complexity, a visualized, dense book on thinking tools for organizational leadership, published in 2014. And the forthcoming book Complexitools, co-authored with Silke Hermann, which is about to be released in 2017. 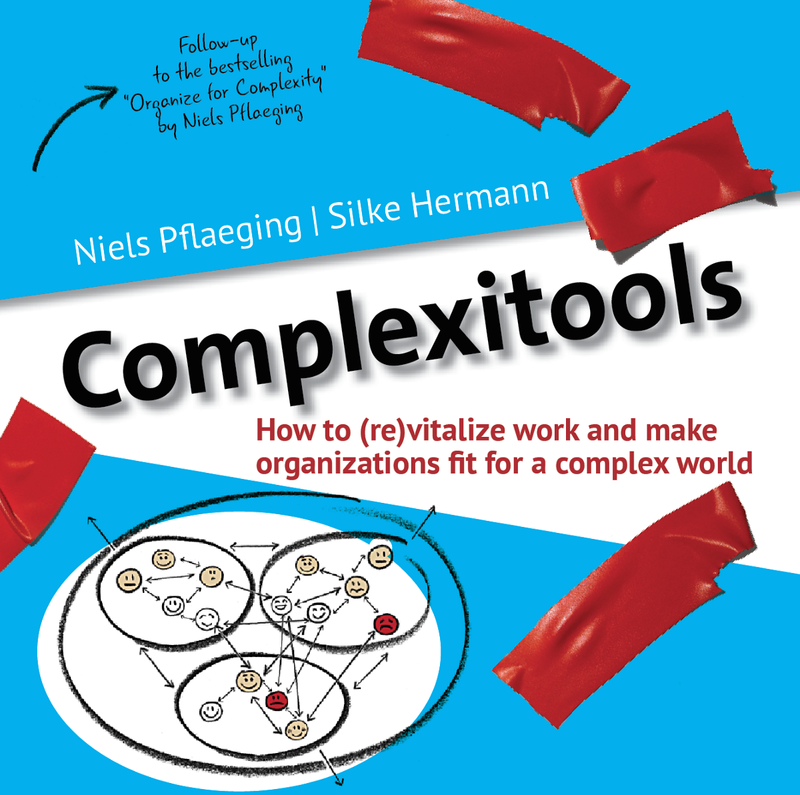 For more about the topic of change in complexity and about Niels´ work, read the BetaCodex Network´s papers on Slideshare. Niels tweets at @NielsPflaeging. He will usually respond to your comments here on Medium.